I just wanted to email to thank you both for your help in getting my bra and prosthesis. You are both so kind and professional. I also loved that you gave me my new lingerie wrapped in lovely pink paper and a lovely bag. Sometimes the small things make a big difference. Just a note to say thank you for the great help and assistance you were to me, and ,im sure, to all who attended the Care Centre last week for the fittings. As usual, you were so helpful and considerate and nothing was a bother to you. Your experience was obvious when you knew what I wanted, even when I didnt!!!! Thanks for sending the tankinis…………I love them and they are a perfect fit…Thank You. All good wishes and thanks for a GREAT service. The parcel has just arrived today before lunch time. Thank you so much for all your help and support. Mammy is out of the hospital today, going to have a nice chat with her over Skype. Going to Russia in a few days with a nice surprise. Thank you again, ladies. We have made my day then and today. “Thank you so much for your help recently and for giving me the adhesive prosthesis – it’s really comfortable and is makink a huge difference to me – I’ve been swimming and running with it, and it’s perfect! Pauline and Kate so nice and know exactly what they are doing! No messing around, will tell you as is and with total empathy and understanding! With them since 2005 and would never change! Highly recommend! Excellent service, lovely people to deal with, very helpful. Thanks Kate for looking after me so well. Such a pleasure visiting this unique shop. I always come away feeling special. Pauline and Kate have a genuine interest in their clients and their professionalism shows. They know exactly what you bought on a previous visit and why u made that choice. They give you all the time you need in a warm comfortable, elegant surroundings. The location is ideal as the patients have the privacy from all the trees and generous planting in the driveway. Thank you to you both. Kate and Pauline are professional sensitive and kind to their clients. 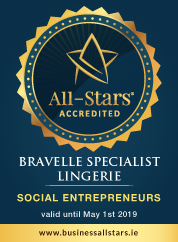 Their service is extremely efficient and caring and they make bra shopping easy. They have a superb range of bras and understand our needs. Thanks ladies. Pauline & Kate are just so understanding & know exactly what you want.. Being going to them for 10 years & got some fabulous bras & swimsuits from them.. Would go nowhere else.. Appointment & privacy what more could you ask for.. Thank you both so much..